Why is it important for science center and museum professionals to cultivate soft skills? What is their relevance to our work and to the wider informal science learning field? For more than a century, researchers have recognized that soft skills—critical thinking, communication, and creativity—are as valuable as technical expertise for a successful career. Discipline-specific skills do matter, but soft skills may matter more when it comes to working in an organization with a mission that includes science engagement and communication with children, youth, families, and the general public. How can we ensure that science center professionals are well versed in soft skills and capable of fostering these skills in learners? The recognition of the importance of both technical and nontechnical skills in the museum field is not new. In 1889, the president of the U.K. Museum Association identified the important skills for a museum curator as “skill, manual dexterity, and good taste,” as well as “punctuality, habits of business, conciliatory manners, and, above all, indomi-table and conscientious industry in the discharge of the small and somewhat monotonous routine duties” (Flower,1898). A few decades later, the director of the American Association of Museums (now the American Alliance of Museums) stated that “success in a museum career depends upon a combination of personal capacities as much as upon either education or skill” (Coleman, 1939). A study of engineers in 1918 is often cited as the first significant research on soft skills in the work-place. At that time, training and university programs in engineering were proliferating to meet the demands of a nation engaged in the first World War, and the Carnegie Foundation funded an in-depth study of the skills and knowledge needed to be a successful engineer (Mann, 1918). More than 1,500 engineers responded in writing to the question, “What are the most important factors in determining probable success or failure in engineering?” Along with technique, the major factors were described as personal traits, such as common sense and tact. Seven thousand members of engineering societies then ranked six categories of the characteristics identified in order of their relative importance: character, judgment, efficiency, understanding of men, knowledge, and technique. Character was almost unanimously at the head of the list, while technique was on the bottom. The 1918 research referred to these skills as personal traits, but they are now more commonly referred to as soft skills. While there are many definitions of these skills, they often include the following things: effectively interacting with others, problem-solving, self-awareness, creative and analytical thinking, and persistence. Hard skills or technical skills are those that are tied to a particular discipline or body of knowledge and can be more easily defined, measured, and taught. For example, a geographer needs to know longitude and latitude; an astronomer needs to know how to manipulate mathematical calculations; and a wildlife biologist should learn scientific nomenclature. Current research on job trends supports the importance of soft skills for employment, promotion, and success. The Future of Jobs and Jobs Training, a 2017 study by the Pew Research Center, concluded that, “In today’s high-tech, information economy, most American workers rely more on soft skills than on technical skills to do their jobs”—with soft skills described as critical thinking, written and spoken communication skills, and interpersonal skills (Rainie & Anderson, 2017). Similarly, in a global study by Deloitte, companies identified “complex problem-solving, cognitive abilities, and social skills as the most needed capabilities for the future” (Deloitte, 2018). In recent years, there has been increased attention to defining the skills, knowledge, and expertise that are important to ensure a learner’s success in the 21st-century. The Institute of Museum and Library Services (IMLS) includes a significant number of soft skills in their list of 21st-century skills, recently updated and included in the sidebar (Museums, Libraries, and 21st-century Skills, 2009). The full list of categories presented in the sidebar describes a wide range of acquired knowledge that includes not only the communication, collaboration, and creativity long considered soft skills but also cultural, technological, and environmental literacy skills. If these are the skills that students and learners need in order to be successful, what do teachers, educators, designers—and all participants in the learning infrastructure—need to know in order to foster these skills? With funding from the U.S. National Science Foundation (NSF), a team of researchers and practitioners have been working to understand the skills and competencies that make professionals successful in informal STEM learning (ISL) settings like science centers and museums. To create the ISL Professional Framework, project researchers asked professionals from science museums to describe the tasks that make up their day-to-day work and then to identify the skills and knowledge needed to successfully complete those tasks. Of the 31 key skills identified by people representing all stages of career progression, 25 were soft skills such as decision-making, critical thinking, active listening, collaboration, and communication (Wojton & Heimlich, 2016). These results were validated by a survey distributed to more than 1,000 professionals at science centers and museums across the United States., including people at different career stages and job roles at a broad range of museum types and geographic locations. They then used this information to create an initial framework of what museum professionals need to know. 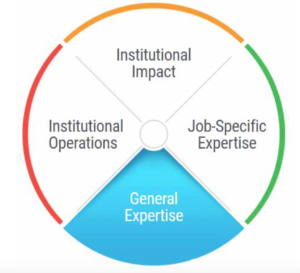 The framework is structured into four domains of competencies: two domains focus on understanding the ways institutions work in the ISL field; the other two focus on the ways individuals work within institutions. One of the four domains of competencies, “general expertise” (a.k.a. soft skills) describes knowledge, skills, attitudes, and behaviors that are not specific to a job or role but to the way individuals interact with their work and their work environment. These competencies also include interpersonal and intra-personal skills, the capacity to think creatively and analytically, and the ability to communicate effectively in varied formats—referred to as “soft skills” in other studies. A person with strong soft skills is often described as “a natural,” implying that these are characteristics we either have or don’t have. But soft skills can be developed and learned. Most research on the efficacy of teaching soft skills concludes that they can be developed through practice, mentoring, reflection, and other techniques that rely on time, commitment, and clear goals. While there are many reasons to encourage development of soft skills for professionals, there are also inherent challenges. Soft skills can be harder to measure and harder to teach, and they are closely related to societal or group norms. Organizational research shows that perceptions of “cultural fit” and “appropriate behaviors” are connected to gender, race, socioeconomic status, age, and other issues of personal and social identity. Developing soft skills could support cultural biases of “what is appropriate” (Gorman, 2015). conversations in order to seek cooperative solutions. So how should science center professionals talk about and think about soft skills? With deliberation, with evidence, and with attention to the needs of our communities and the core principles of informal learning. In spaces that cross multiple disciplines and that seek to be sites of public discourse about the impacts of STEM on society, soft skills are especially important as core competencies for science center professionals. This material is based on work supported by the NSF under grants DRL1514815, DRL1514884, DRL1515315, and DRL1514890.Kris Morrissey, an educator and researcher with Morrissey Research, contributed to this article. Morrissey is the former director of the museology graduate program at the University of Washington in Seattle. Lesley Markham is program manager of professional development strategic initiatives at the Association of Science-Technology Centers. About the image: The ISL Professional Framework is structured into four domains of competencies. Two of the domains focus on understanding the ways institutions work in the informal STEM learning (ISL) field. The other two domains focus on the ways individuals work within institutions, including general expertise. Image by islframework.org. Coleman, Laurence V. 1939. The Museum in America: a critical study. The American Association of Museums, Washington D.C.
Deloitte’s Human Capital Trends (2018). From careers to experiences. 41–47. Flower, William H. 1898. Essays on Museums and Other Subjects Connected with Natural History. MacMillan and Co Ltd, London. Gorman, E. H. (2015). Getting ahead in professional organizations: individual qualities, socioeconomic background and organizational context. Journal of Professions and Organization, 2(2): 122–147. Institute of Museum and Library Services (2009). Museums, Libraries, and 21st-century Skills (IMLS-2009-NAI-01). Washington, D.C.
Institute of Museum and Library Services (2018). Museums, Libraries, and 21st-century Skills: Definitions. Mann, C.R. (1918) “A Study of Engineering Education” prepared for the Joint Committee on Engineering Education of the National Engineering Societies. Funded by the Carnegie Foundation. Rainie, L. & Anderson, J. (2017). “The Future of Jobs and Jobs Training,” Pew Research Center. Wojton, M.A., & Heimlich, J.E. (2016). Professional Learning Framework: DACUM Panels Workshop Feedback.